This is one of two storage units in Gunnison where at least six suspects, all described as drug addicts, stored thousands of items stolen from Sevier and Sanpete counties. MANTI—After an investigation running at least five months and spanning from Mt. Pleasant to Richfield, the Sanpete County Sheriff’s Office has arrested six suspects and found thousands of items stolen from various parts of Sanpete and Sevier counties. The apparent thieves operated independently of each other. Their connection was that they all took their goods to the same two storage units. And, according to Sanpete County Attorney Kevin Daniels, the suspects have one other thing in common: They are all drug addicts. Initially, the Sheriff’s Office had several investigations going that did not seem to have any connection. That changed when Deputies Dallin Pace and Breezy Anderson served an arrest warrant on Breonna Thurston on Nov. 7, 2018 at a residence north of Ephraim. During the arrest, they noticed several firearms along with ammunition. Knowing Thurston was a convicted felon and restricted from possessing firearms, the deputies obtained a search warrant for the residence. While searching the residence, they found drug paraphernalia. The deputies obtained another search warrant for drugs. During a further search, items matching known stolen goods turned up. Pace and Anderson contacted another deputy who had been investigating thefts in the county and confirmed the identity of the stolen items. From the information obtained at the residence, deputies obtained a search warrant for two storage units in Gunnison. That search turned up the thousands of items. Deputies identified items from reported thefts in Richfield, Salina, Gunnison, Ephraim and Mt. Pleasant, among other locations. 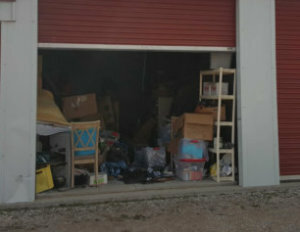 Sanpete County Attorney Kevin Daniels said the thieves stole “anything that wasn’t nailed down.” Daniels described the crime operation as a “headless hydra.” The suspects’ main connection was that they all knew Breonna Thurston, who had leased the storage units. Three suspects received fairly minor charges. Sean Clark was charged with one count of obstruction of justice. Wyatt Clark was charged with possession of a controlled substances. Chris Brown was charged with a probation violation and possession of a controlled substance. Three other suspects face more extensive charges. Chris Thurston, who is currently in jail for a previous conviction, faces four counts of burglary and theft. Garrett Clark faces 16 counts, including possession of a stolen financial transaction card, identity theft, forgery, burglary, theft and possession of a stolen firearm. He also has outstanding charges in Utah County of possession of a firearm by a restricted person and possession of controlled substances. Breonna Thurston is facing 22 counts, including unlawful use or possession of a financial transaction card, identity theft, forgery, burglary, theft and possession of stolen firearms. At the time of arrest, she had outstanding charges of DUI and possession of controlled substances in Sanpete County. Daniels is already seeking to have the defendants accept plea offers in hopes of resolving the cases quickly. He said two of the defendants had been given offers to go to drug court. The county attorney said all of the defendants are addicts and repeat offenders with whom he has had previous dealings. As such, he wants to make sure they address their addiction as well as take responsibility for their actions. “If you eliminate the addiction, you eliminate future burglaries. Its crime prevention and crime punishment all in one,” Daniels said.